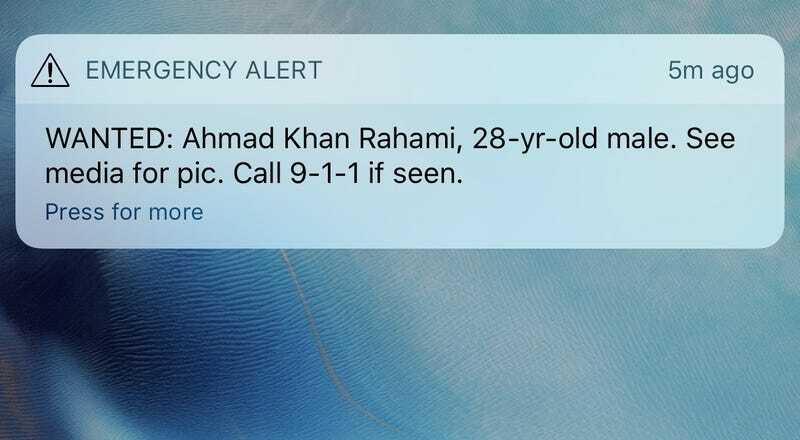 People all over the New York area were awoken this morning by the alert above, which seeks information about Ahmad Khan Rahami, a person of interest in the bombings in New York and New Jersey over the weekend. The alert says that Rahami is wanted for questioning in connection with the Saturday night bombing in Manhattan, which injured 29 people. Authorities believe the Manhattan bombing was linked to an earlier bomb that exploded in a trashcan in Seaside, New Jersey. On Sunday evening, three pipe bombs were discovered in a train station Elizabeth, New Jersey. New York City mayor Bill de Blasio called the bombing “ an intentional act.” Following the bombing, a second explosive device made from a pressure cooker was found a few blocks away. All 24 people sent to the hospital with injuries stemming from the bombing have since been released. It seems this is the first time a smartphone alert has been sent out in search of a bombing suspect. The alerts are frequently used for AMBER alerts or severe storm warnings. UPDATE: 1:00 PM EST: According to The New York Times, a spokesperson for NYC mayor Bill DeBlasio confirmed this was the first time a mobile alert was used for this time of situation. Presumably this alert would fall into the category of “Imminent Threat Alerts,” but it’s unclear if an alert like this has ever been used as part of a manhunt for a bombing suspect. UPDATE 11:47 AM EST: Ahmad Khan Rahami has been arrested.